Vasant Desai was the composer who could easily pivot the various situations of life around his simple and classy tunes. He was a man of great musical insight. He could easily grasp the situations and put them successfully in his songs. Who can forget his composition, 'Aei Maalik Tere Bande Ham..', in fact, Punjab govt. declared it as a part of morning prayers in their schools. Vasant Desai was born in 1914. In his early days, he used to act in silent films. Prabhat's Khooni Khanjar (1930) was his first film as an actor. He also used to sing songs in films. He sang his first song, 'Jay Jay Rajadhiraaj..' in Ayodhaya Ka Raja (1932). In 1934, he sang a popular 'Kajri', 'Barsan Laagi..' in Amrit Manthan. He sang many songs in those times in various films. But that was not his destiny, his career took a turn with 1939's Aadmi. He could not managed to get the role of Hero in the film, so gave up acting and started his training in music, under Ustaad Aalam Khan and Ustaad Inaayat Khan. He became an assistant of music director Govind Rao Tembe. He did Our India, Monsoon, Amar Bhoopali, Shobha Aankh Ki Sharam and Mauj with him as an assistant. He got his first opportunity in 1943 to work independently for Shantarm's Shakuntala. The film was a major hit of those times. It ran for 104 weeks. After Shakuntala's overwhelming success, Vansat Desai became a part of V. Shanatram's Rajkamal Studio. He gave unforgettable music for Shantaram's Do Aankhen Barah Haath and Jhanak Jhanak Paayal Baaje. He became very popular in his early career as a music director. He composed music for 14 films in the 1940's. Parvat Pe Apna Dera (1944), Subhadra (1946), Jivan Yatra (1946), Dr. Kotnis Ki Amar Kahani (1946), Matwala Shaayar Raam Joshi (1947), Uddhar (1949) were some of his popular films. In 1955, 1956 and 1957, Rajkamal's Jhanak Jhanak Paayal Baaje, Toofan Aur Diya, Do Aankhen Baarah Haath, got released. Desai worked very hard for the music of these films. He gave all sort of music in these films, successfully. He used pure classical, folk and thematical music perfectly for these films. Jhanak Jhanak Payal Baaje was purely based on dance theme, so he composed classical dance tunes. He used the voice of great vocalist Ustaad Amir Khan for the title song of the film. In 1960's he did comparatively less number of films but he managed to maintain his style and melody of his tunes. Use of classical music was clearly visible in his music in this era. The decade saw the release of Pyar Ki Pyaas, Raahul, Yaadein, Ladki Sahayadri Ki, Bharat Milaap, Aashirwad and few more. Yaadein (1964), was a movie with only one artist and the story was portrayed with the help of background music and dialogues. It was a big task for Vasant to compose the music for 'Yaadein', yet he came out with perfect background score and a perfectly composed 'Dekha hai sapna koi..' sung by Lata Mangeshkar. 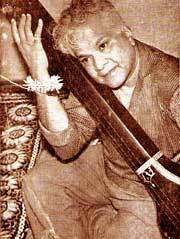 Later, in 1974, when Gulzar made Achaanak, which again was a songless film, he called Vasant Desai for its music. The film has a great weightage for background music and Gulzar knew that Vasant was the perfect man for the job. Vasant did a great job as expected, for the film. Vasant Desai used the voice of veteran Ashok Kumar for his film Aashirwaad (1968). He put his best effort for the music of Aashirwaad. 'Ek thaa bachpan..' sung by Lata Mangeshkar was composed in Raag Pooriya Ghanashri. He composed "Jeevan Se Lambe Hai Bandhu..' sung by Manna Dey in Raag Shiv Ranjini. Vasant introduced Vani Jayram in Guddi (1970) as a playback singer. 'Bole Re Papihara..' sung by Vani is one of a few remembered rain songs, till date. He introduced Dilraaj Kaur in Rani Aur Laalpari (1975), as a playback singer. Vasant believed in quality and not quantity, therefore he composed music for only 46 films. He never felt at ease while composing qawallis or ghazals. He always gave his heart for classical music. His favourite poets were Majrooh Sultanpuri, Kavi Pradeep, Gulzar and Pt. Narendra Sharma. He left us in 1974, with his 'Yaadein'.